Now that spring is upon us, Texas parents are gearing up for a season of family fun, which usually begins with a community Easter egg hunt (or two). But where can the kids go to search for candy-filled eggs in 2019? Put Sharpie to calendar, grab your baskets, and load the family up in your GLC – here are some of the best Easter events near San Antonio. What? Farm Fred is bringing back his Garden Spring Carnival. Free age-grouped Easter egg hunts, carnival prizes and games, candy, live entertainment, and more will be available. For updated info about this annual San Marcos Easter event, including times, find contact details at www.sanmarcostx.gov. What? Kids can enjoy more than just an egg hunt at this annual Boerne Easter event. Other activities include face painting, arts and crafts, a visit from the Easter Bunny, and an enormous inflatable obstacle course. Parking at the park is free all morning, too! Get more info at the City of Boerne website. What? 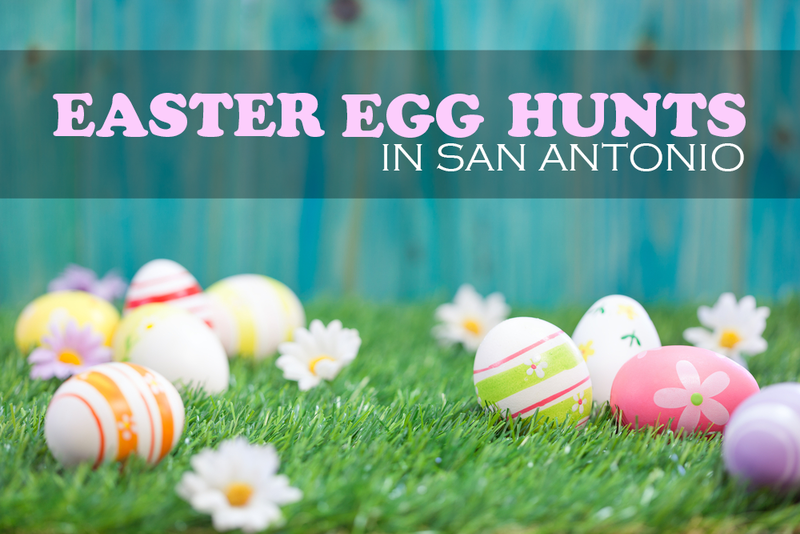 Held just down the road from our San Antonio Mercedes dealership, this annual Easter egg hunt will be held on the Church’s North Lawn. Thousands of eggs will be scattered around the area, so don’t forget to bring your baskets! Contact the church or look at their calendar for updated information. What? Sponsored by the Thomas J. Henry law firm and your favorite local grocer H-E-B, this Corpus Christi Easter event will feature over 20,000 Easter eggs (and 10 special-prize-filled golden eggs). Free for families, the Easter egg hunt is perfect for kids up to the age of 10. For more details and times, visit thomasjhenrylaw.com. What? Hourly Easter egg hunts in The Meadows of this Devine tree farm. Additional activities include photo ops with the Devine Acres Country Easter Bunny, hayrides, horseshoes, sand volleyball, “burlap” bowling, bocce ball, a petting zoo, and dozens of other games and crafts. For admission pricing and additional details, check devineacresfarm.com. What? Hosted by the Congelato ice cream shop and Urban Provisions clothing store, this 2nd annual Easter egg hunt will run for two hours on the day before Easter. While you’re there, head to the local shops for special pricing on Easter decorations, treats, and goods. Mark yourself as “Going” on the Eggstravaganza Facebook page, or just show up—it’s free! What? Hosted and sponsored by St. Mark’s Episcopal Church, this kid-favorite Easter event is perfect for families. Pack a lunch, bring the wicker baskets, and enjoy the pre-Easter celebration on the lawn. Track any new updates on the St. Mark’s website. What? The Redeemer Lutheran Church is holding their annual Easter festivities at the ELT Park this year. Not only is there an egg hunt scheduled, but hosts will also be reading a special Easter story for the kids. Although the Easter egg hunt and activities are free, the church asks you to register online. What? In addition to the region’s largest Easter egg hunt – seriously, the church scatters more than 40,000 eggs around the property – EGGStravaganza also features free family-friendly activities like kite flying, lawn games, face painting, a raffle, and a bunny-petting area. Check out reallife.org for more information or to volunteer as a helper. What? The Salem Media Group-sponsored free egg hunt at Traders Village is back, this time with more eggs! Children aged 0 to 3 years are up first at 10:30 AM, followed by 4-to-6-year-olds at 11:00 and 7-to-9-year-olds at 11:30. The hunt concludes at noon with the older 10-to-12-year-old group finding the last eggs. Review more details on their official Facebook Events page. What? The Parkway Church in Victoria will be hosting an evening filled with family-oriented fun. Food trucks will be on their campus, guests will be treated to storytime, and, of course, the Easter egg search will keep kids happier than clams. Add this Victoria Easter event to your calendar by visiting the Parkway Church site. This Easter, we invite you to search for more than just eggs—visit our Mercedes dealership near New Braunfels to find incredible offers on certified pre-owned Mercedes vehicles and the most popular new Mercedes-Benz models, like the C-Class sedan and GLS luxury SUV. Spring is the perfect season to shop for a new luxury car, and Mercedes-Benz of San Antonio is here to make your experience otherworldly. Contact our Mercedes sales team at (210) 920-3235 to request a quote or discuss your auto financing options. Serving shoppers in Schertz, Seguin, and the surrounding Texas area, our dealership is conveniently located at 9600 San Pedro Ave in San Antonio. Stop by for a test drive this Easter weekend!